That’s the day when access to FamilySearch is going to change. Up until tomorrow, users who aren’t signed in have been able to see some records, some indexes and more. Tomorrow, Wednesday, December 13, 2017, that will change. To access anything on FamilySearch, starting tomorrow, Wednesday, December 13, 2017, all of us — The Legal Genealogist included — are going to have to sign in with a free FamilySearch account. Did I mention that this is happening tomorrow, Wednesday, December 13, 2017? Yeah. Really. Tomorrow. Wednesday, December 13, 2017. And yes, it’s really going to happen. For the most part, this is a small inconvenience — a minor price to pay for major-league access to free records. As I’ve noted, creating an account on FamilySearch is easy and free. You don’t need to give the website a ton of personal information to get the account. Name, username, a password you select, an email address or phone number in case you lose your password and need to get back into your account, a little bit of demographic data (male or female, country of residence, birthdate and whether you’re a Church member, since Church members have different needs from the website than heathens like me), a security captcha code to make sure you’re not a robot and your agreement to the terms and conditions and privacy policies of the website, and you’re in. FamilySearch offers a rock solid guarantee that it won’t use your information for anything other than giving you access to the website, unless you specifically and personally authorize it. Nobody’s going to sell your info to a third party; nobody’s going to come knocking on your door. Why is this happening? In large part, because FamilySearch is moving from a microfilm world to a digital world. Instead of ordering a roll of microfilm from the Family History Library, waiting for it to arrive at a Family History Center or affiliate library, and then accessing it on often outdated equipment, we’re now going to be accessing more and more records digitally — and more and more of them without ever leaving our homes and our own computers. But to be able to present many of those records to us with that kind of ease, FamilySearch needs to be accountable to its records partners — the towns and counties and states and their agencies that made the records available for filming in the first place. Many of those records partners want to know that the data is being offered in a safe and secure online environment. And this is the part of the process that isn’t without some major inconvenience — and frustration — for users right now. Because records that we used to be able to see, online, at 3 a.m., in our bunny slippers, are now not accessible online from home at all. To view these records, we’re told, we have to go to a Family History Center (FHC) or affiliated library or view them at the Family History Library in Salt Lake City. Now this isn’t any different in terms of convenience from ordering the microfilm to be delivered to an FHC or affiliated library (and you can find those locations here). But, for some key records, it’s a big difference from online access just a few weeks or months ago. We’re told that some of this is temporary while permissions are ironed out with the original records repositories that allowed the microfilming in the first place. But some of it is likely to be permanent: not all records custodians are going to agree to allow their records to be available online to anyone. So… be prepared for change — and some big changes — in access at FamilySearch. And be prepared, tomorrow, Wednesday, December 13, 2017, to have to sign in to see anything at FamilySearch at all. I’ve been experimenting with the access now only available at a Family History Center or an affiliated library. My public library is one of their affiliated libraries. Yes, you do have to go to the library, but it is truly awesome to immediately access many of those records that were only available on microfilm. And those digitized books–they are available now also. I was told by the librarian that I will need my user name and password to login even when using the FamilySearch resources at the public library. Small price to pay. A comment and then a question: First, thank you for keeping us informed. Signing in is a small price to pay for the access received. Now the question: I have a friend who is a local genealogist in Germany (who has and continues to help me and my extended German family to 6th cousins in the US and in Germany) trace our ancestry. He cannot access records through Family Search. The access seems to be blocked in Germany. I have another friend in Austria who can access the Family Search records (even the German ones) with no problem. (He also has helped me with my Austrian and Burgenland ancestry research.) Is there some sort of disagreement between the Mormon Church and Germany that is preventing my friend from accessing records through Family Search? He asks me to look for records for him — but I don’t know German language. The fact that the records are also often in old German script doesn’t help either. But my major impediment is my lack of knowledge of German at all. I just did a little internet search and saw something that suggested that the Mormon Church in Germany may have been supportive of Nazis. Perhaps that’s the problem. My friend asks me for film numbers, but I doubt that will help — since I assume they are FHC film numbers. But I do look for the names of repositories in Germany, hoping that he can contact them within the country to access the records. Since this friend has opened up the window to my German ancestry for several hundred years and introduced me to some wonderful living relatives over the past 15 years, I want to help in any way I can. Individual repositories have contractual limitations that prevent FamilySearch from making records available at some times or in some places. For specific details, you’d have to ask FamilySearch. I am a Mormon. The LDS Church has never been supportive or affiliated with the Nazi regime. The LDS church has many members in Germany. If access is limited in Germany, it is not because of willingness for the LDS church to have the records accessible. Their mission is to help families connect with their ancestry….EVERYWHERE. Perhaps there are localized laws or permissions that limit what is available in Germany (by the government) or the organization or facility your researcher is trying to use for access. Thank you for the clarification, Erica. I will pass the information along. In the meantime I did some searching and see that there is a Family History Center in Wetzlar, which lists phone number and hours of operation (which makes me think it is probably active). Wetzlar is not far from my friend’s home. Oh good. That should be an excellent resource for your friend. (The local LDS Family History center). Like Judy mentioned above….there are a lot of records that are only available if you visit the center. I have recently dug into a couple of my family lines where I am back a few hundred years…and I am amazed at the old books and archived records that exist. However, most of them are not electronically available to me at home. I must walk into the center and sit at one of the computers there. Not a huge sacrifice. I’ve been told that it all has to do with honoring the copyright requests of those who’ve made the records available. I’m glad I live fairly close to one of these centers (also). I am able to view the records I am unable to access at home. At home, I can put the files I want to see in my “print” cue for easy finding. At the center, I don’t have to find the records again…and rather than print, I am able to download them to my thumb drive in 10 minutes and that’s all hassle there is. I often come out of there with thousands of pages to sift through….all on my thumb drive where I can print them later at home if needed. I hated the old family history centers with the old microfiche film etc…. I’m amazed at home much things have updated in the last 10 years. It’s awesome. It’s not a copyright issue (most of these records are way way way out of any copyright protection) but rather a contract issue in terms of access. The LDS decided to handle their record collection this way mainly because it was the lowest cost way (to the Church) to make the largest amount of records available. The result is typical of any massive new IT project, it is a mess. They will eventually get it working, but access to the records right now is not reliable. Have not been to the LDS site in quite a while. It used to be full of errors as far as my family tree went. Wonder if that has changed. Well, I will login tomorrow and give it a shot! Thanks for the heds up Judy! Remember that the site is a LOT more than just the Family Tree, Stan, so even if the info on our family is — um — shall we just say not the best, it’s still a great site for original records. Don’t just look for family trees. Use them for clues! The original records are what you should be looking for. You may have already answered this but WHEN will folks have access to the records from their own computers? I tried to get into Nacogdoches County, Texas Probate/Will records and it said access only at approved LDS libraries. So will these records ever be able to be accessed by older folks like me who want access from the comfort of their home computer? There’s no 100% guarantee that we’ll ever have access at home to every record set. Every record set has to be negotiated with the original provider, and some are just not going to say yes to having their records online. Strangely bizarre! I’ve tried setting up an account several times, but each time I can’t get past the password step. 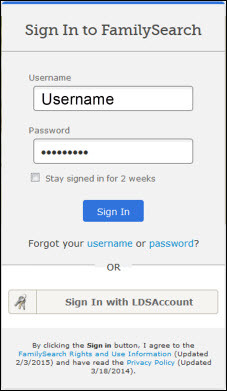 LDS doesn’t like the password I choose, saying it’s either a first or last name. LDS is OK with Romney123, but not some unintelligible collection I choose. What is going wrong? You’ll have to ask FamilySearch. Their house, their rules. There’s a Get Help menu on the top right of the home page. Please be patient with the LDS. They have launched a very large computer project and I doubt they were prepared for the complexity. It is causing problems for the local FH centers as well. This will eventually be fixed but not quickly.